My first tests involved putting in the batteries and pressing the “test” button on the transmitter. I’d press the button maybe 50 times, and it would make the LED on the receiver light up maybe 30 times. Not exactly great. These were all at close range too, so distance was not a factor in these tests. I then connected the receiver to an old Sunpak auto 433 D and took some real photos. Again, the results were good but not great. It would fire most of the time, but on occasion it would go maybe 4 or 5 times in a row without firing. The distance for these tests was maybe 25 feet. Cactus Wireless Flash Triggers V2s with a new Panasonic CR2 battery. 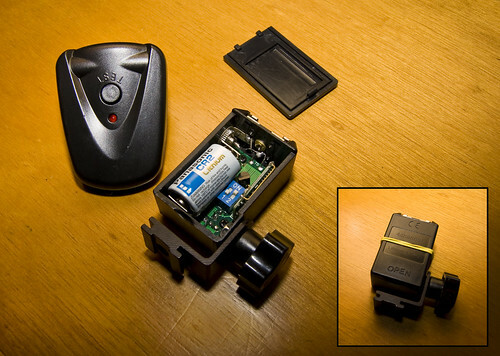 Inset shows a rubber band to help keep the battery cover in place. I did a bit more reading of reviews and comments around the web (there’s a great one here, by the way) and one comment I found mentioned that replacing the batteries would help with the reliability. I ended up getting some new batteries from DealExtreme, a 5 pack of Panasonic CR2s for under $7. Just for fun I tried the “test” button again to light up the LED on the receiver, and out of 200+ tests, I only saw the LED not light up twice. Much better results than before the new battery was installed. Keep in mind, these are the V2s models, not the newer V4 models. I’m actually pretty satisfied with the v2′s for now and see no need to upgrade to the V4′s. With everything right in the world, the V4′s should be an improvement on the V2s’ but things are not always right in the world. If I had to sum up it, I’d say the Cactus Triggers are “good but not great.” They’re definitely a good value, and a great way to get started in off-camera lighting. Heck, even if you do have Pocket Wizards or another well-known name in wireless triggers, these Cactus triggers might make a cheap backup solution in case of an emergency.